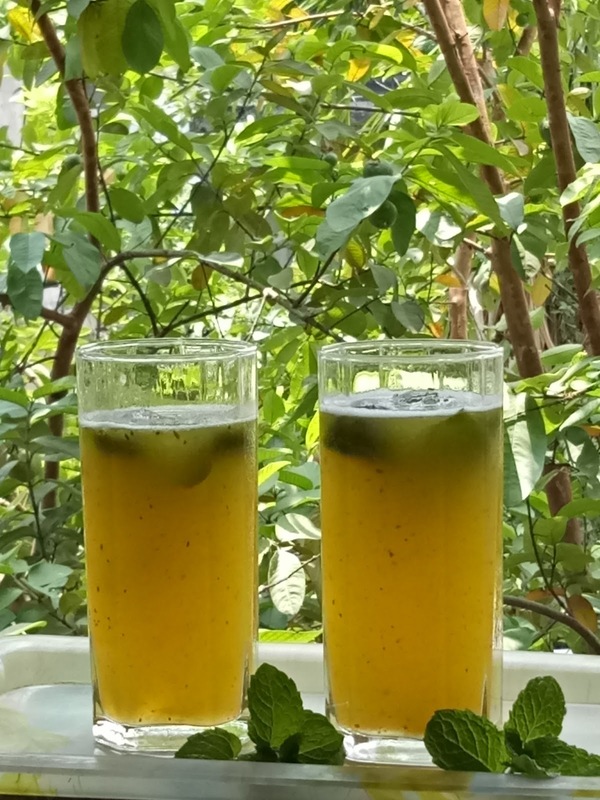 One of the most refreshing drinks to beat the heat is this drink made from unripe green mangoes. It’s almost the end of the season for green mangoes and the markets are already getting flooded with ripe ones. 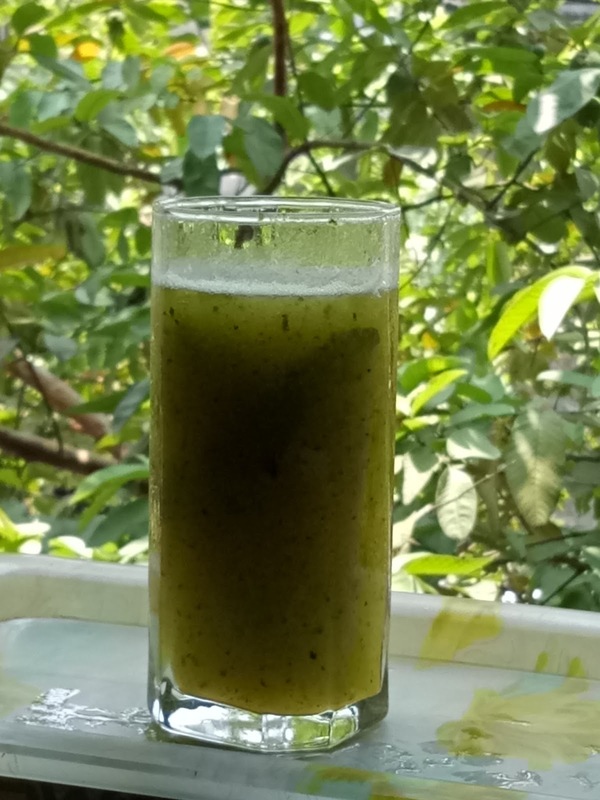 A vegetable vendor came selling mangoes and a whole lot of leafy greens yesterday and the first thought that came to my mind was, aam panna. The mangoes were about to ripen which is why the drink looks more yellow than pale green. You can use regular ice cubes but I wanted to infuse more flavour in the drink. 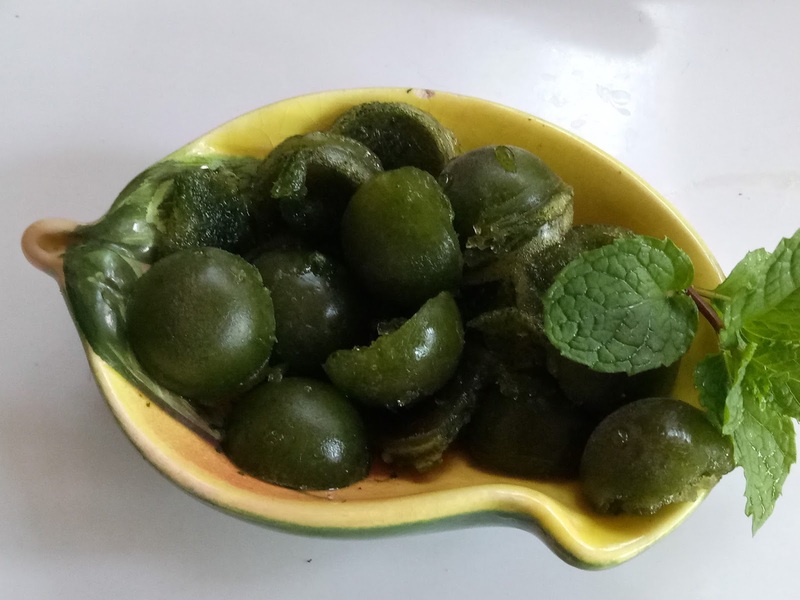 So I ground a bunch of mint and added some water, pepper, toasted and powdered cumin and rock salt, This mixture went into an ice tray to be turned into minty ice cubes. Wash and cook the mangoes with very little water in a pressure cooker. I used a small cooker and waited till the third whistle. After the steam goes off, take the cooked mangoes out, discard the water and let them cool down. Once cooled, peel off the skin and take out the pulp. Discard the seeds. Place the pulp in a blender and blend till smooth. Transfer the pureed mango to a large bowl/jug and add the sugar (I used sugar syrup that I had in the fridge), salt, cumin powder, pepper powder. I have not mentioned the quantity of these ingredients as it’s to do with personal preferences. For the sweetener, you could use honey or jaggery also. At this point you could add water and serve in individual glasses or store in the fridge so that the mix is ready and the drink can be made by adding water as and when required. I made mine thick so four mangoes (medium-sized) produced only six glasses of juice. Add the ice cubes and enjoy! Add more fresh mint if you like. The minty flavourful ice cubes took the drink to another level. 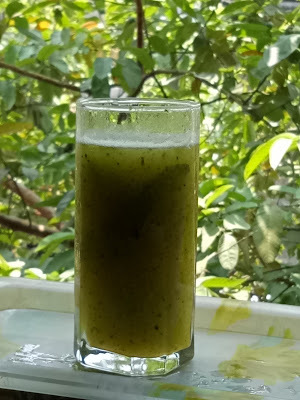 And when the ice melted, the drink took a greenish tinge, more like the colour that we are accustomed to when we think about ‘aam panna’.